I'm going to come clean about something. It's shocking and some of you might tsk-tsk me but I'm really shameless and not all "foodie"-like some might assume... ready for it? I didn't hear of beignets until 2004. I didn't try one until 2005. And the first beignet I had was, wait for it... so you can really be appalled... was in DISNEYLAND! Disneyland, as in Aneheim, California, Disneyland. Oh yes, folks... read it and weep. My first beignet was in Disneyland at the Ralph Brennan's Jazz Kitchen Express. As far away from New Orleans as one could possibly get inside of the continental United States. Sad, probably a little pathetic I'm sure, but the beignets were fresh, hot, and covered in powdered sugar and I was hungry. That's all that really matters. Also you need to know you don't want to mess with me when I am hungry, you will lose a finger. After having my Disneyland beignets I was a goner. Fried dough covered in powdered sugar served to you in your own little paper bag. I AM SO THERE. Beignets (pronounced BEN-yayz) are now a Christmas morning tradition in our house. There would be a rebellion and I would be kicked out onto the streets if I announced we were having something else other than beignets and hot chocolate for Christmas breakfast. peanut oil for frying, i have used vegetable oil and i haven't noticed the difference. Heat the milk in a small saucepan over medium high heat until small bubbles form at the surface. Remove from the heat, add buttermilk and then pour into a stand mixer bowl. Whisk in yeast and sugar. Set aside for 5 minutes. Add the flour, baking soda, and salt. Mix on low speed, using a dough hook, until the dry ingredients are moistened, 3 to 4 minutes. Increase the mixer speed to medium and continue mixing until the dough forms a loose ball and is still wet and tacky, 1 to 2 minutes longer. Cover the bowl with plastic wrap and set dough aside in a draft free area for 1 hour. Pour enough peanut oil into a large pot to fill to a depth of 3 inches and slowly bring to a temperature of 375 degrees over medium heat (this takes about 20 minutes). Line a cookie sheet with paper towels and set aside. Lightly flour your work surface and turn the dough out on it. Sprinkle the top of the dough with flour, gently press to flatten, fold the dough in half, and gently tuck the ends under to create a rough shaped round. Dust again with flour and roll the dough out into a 1/2 inch to 1/3 inch circle. Let the dough rest for a minute before using a knife to cut the dough into 1 1/2 inch squares. Gently stretch a beignet lengthwise and carefully drop into the oil. 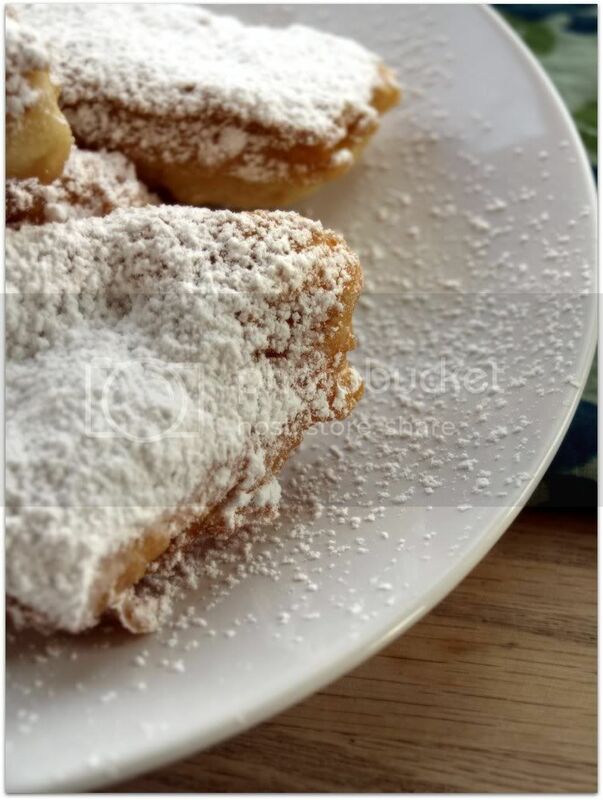 Add a few beignets (don't overcrowd them then they will become a beignyuck) and fry until puffed and golden brown, turning them often with a slotted spoon, for about 2 to 3 minutes. Transfer to the prepared baking sheet to drain while you cook the rest. 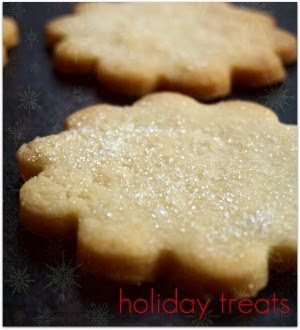 Serve while still warm, buried under a mound of confectioner's sugar. >You can make the dough the night before. Line a baking sheet with parchment paper and spray it with nonstick cooking spray. 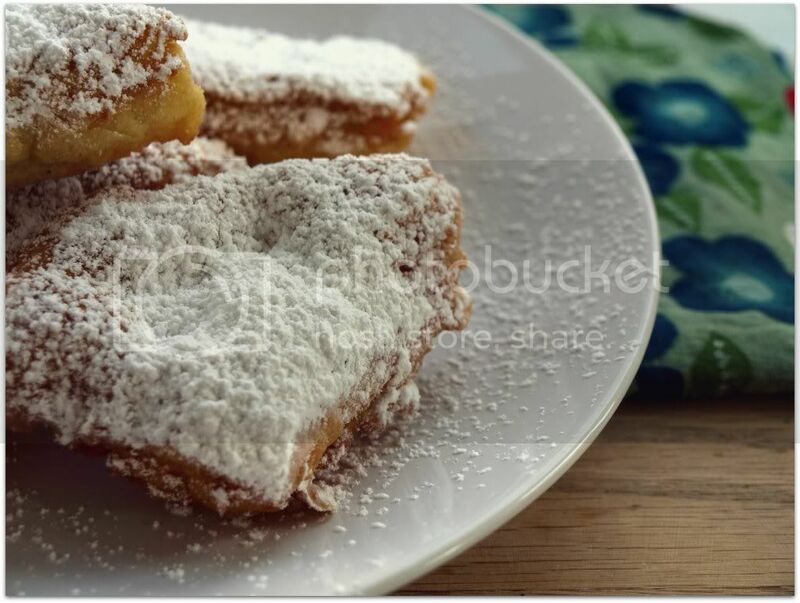 After cutting the dough, place beignets on the parchment paper and place another greased piece of parchment paper, spray side down, on top. Wrap the entire baking sheet with plastic wrap and refrigerate. 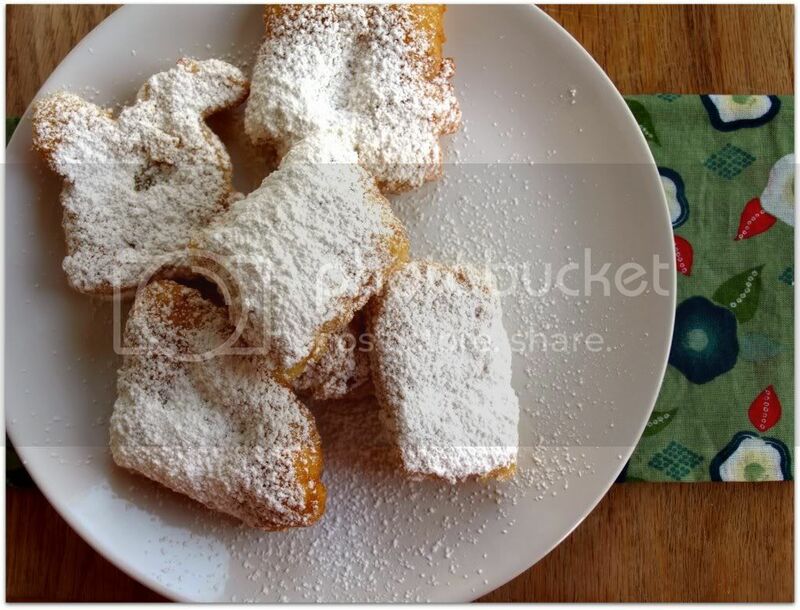 Beignets can be fried straight from the refrigerator. Tasting Notes: Actually I really didn't want to talk about the beignets tasted. I wanted to talk to you about the Dam Good Sweet cookbook. It's a little treasure box of goodies. [172 pages including introduction, recipes, sources, and index] I don't normally recommend cookbooks but I have every recipe marked to bake or cook in the future. Sooooo, if you are looking to spend some of that Christmas money or if the gift cards you might of received yesterday morning are burning a whole in your pocket, you might, just might want to take a look at this book. lots of confectioners sugar!!! 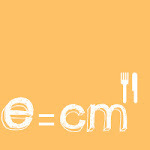 i mean lots... don't skimp. Coincidence that the word "yay" is built into their pronunciation? Nope. Think not. Gorgeous pictures as usual. I had my first about that time too, in NY, at a restaurant called Brasserie. Ben-YAY! I will eat any kind of donut, any time, any where. I even eat three-day-old stale donuts, as long as I have a hot cup of coffee. I should have been a cop. Your beignets look wonderful. I wish I didn't hate deep frying things so much or I might be tempted. I've been to New Orleans twice. Once in college, and once when I was four after my father took me there during a hurricane without telling my mother. I don't remember the beignets, but I do remember palm trees bent in half and using sterno for light in our hotel room after the power went out. 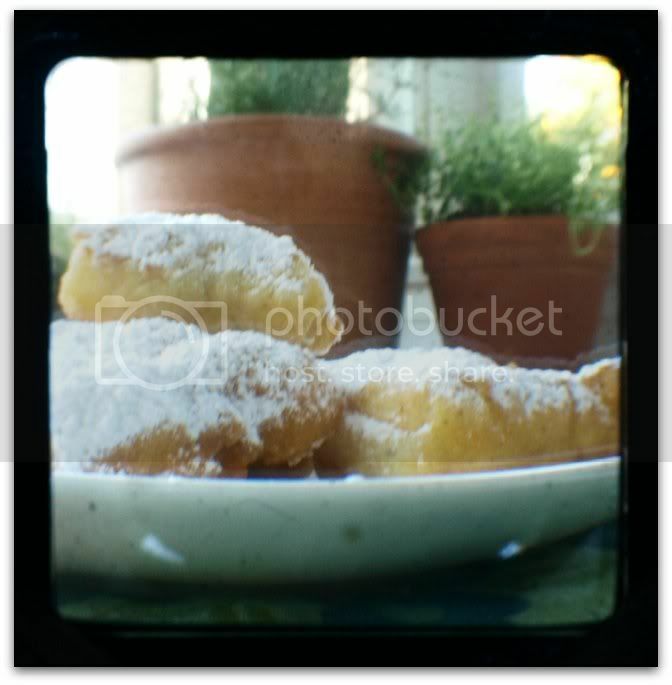 I had a few beignets when I was in New Orleans a number of years ago. Haven't had them since though now you have me craving them. If only deep frying didn't always end up with such a mess! Soooo, did I ever mention my mom is from New Orleans? Anyway, beignets. Yes. Love them, but of course. The true New Orleans beignet experience is eating them on the outside patio of the Cafe du Monde in the French Quarter. Preferably when it's 95 degrees with a million percent humidity, because then, when you blow the powdered sugar off the top, it will stick nicely to your sister's sweaty skin. Powdered sugar fights are a tragically underutilized tourist draw for New Orleans. Oh, and you have to be drinking cafe au lait at the time. And it has to be steaming hot, no matter how hot it is outside. Incidentally, we tried making beignets from scratch once and they were terrible. But the last time I was in N.O., I grabbed a box of the Cafe du Monde mix when I was at the airport, and they were GREAT. The mix has barley flour in it, of all things. Oh, I loves me some beignets. I'm starting a list of the foods I'm going to make when this whole crazy "New Year's Health Kick" nonsense is out of the way and I am not given a guilt trip whenever I break out the deep fryer. This just took the top slot. Beignets and a cup of hot cocoa? Will you be my new best friend?